READ MORE DETAILS ON THE CELEBRATION HERE! SOHO, 64 W. Chippewa St.
We invite you to join us at our 40th Anniversary Celebration for all DSC families and friends on Thursday, October 18, 2018 at Soho Buffalo, NY. It will be a great opportunity to visit with friends old and new and show your support of the Club. Enjoy an open bar and appetizers along with auctions and raffles throughout the night! Various awards will also be presented, highlighted by the induction of the late James Eagan into the DSC Volunteer Hall of Fame. Click the image below to submit your nomination for these awards! Let us know if a coach or parent volunteer has helped make your DSC experience great! Simply submit their name and a little bit about why they should be recognized. 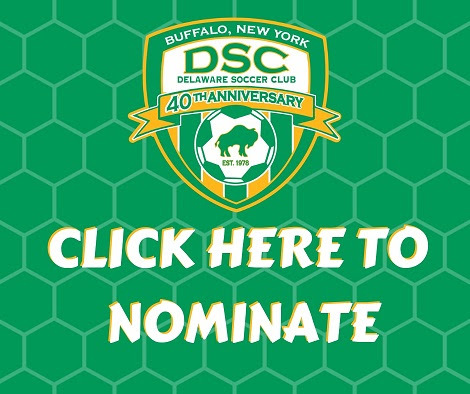 Delaware Soccer Club is one of the largest not-for-profit soccer clubs in western New York, serving over 1,000 players and their families annually. This year marks 40 years of building friendships and developing youth both personally and athletically through soccer. Your support will help us to award scholarships in excess of $30,000 annually to families in the community who would otherwise not be able to play. Your consideration and generosity will make a difference in the lives of many families and are greatly appreciated by all! TICKETS are $40 per person advance sale and can be purchased by clicking here! Tickets will also be sold during House League games Saturday, 8:30-12:30. Tickets will also be sold for $50 at the door. Upload your pictures! : Scroll through your old DSC photos and UPLOAD THEM HERE! Submit some past photos to be included on the slideshow throughout the night! (Just click the "+image" icon at the top of that page). For more information or donation opportunities, please email: celebration@delawaresoccerclub.com. PURCHASE YOUR TICKETS NOW BY CLICKING HERE! Thank you on behalf of the players and club!